It is a renown fact that Feadship, the Dutch based shipyard, is very thorough in every detail. 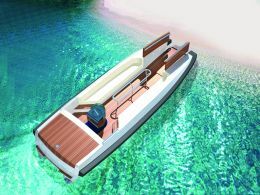 One shouldn't therefore be surprised by the yard's inclusion of a special tender for its new F45 motor yacht considered to be the point of reference of the famous yard's production line. For further information please contact: Feadship Shipyards, Zijlweg 148c, 2015 BH Haarlem, The Netherlands (Holland). Tel: +31 23 5247000. Fax: +31 23 5248639. Webpage: www.feadship.nl. Email: info@feadship.nl. The idea stemmed from observing that no matter how embellished or technically advanced tenders could prove to be, the market's offer rarely equalled the innovative concepts applied to the pleasure yacht's spacious garage which is still being fitted out. Inevitably, the conclusion was to design and build its own tender. The nautical design thus became Feadship De Voogt Naval Architects' responsibility, while Sinot Design Associates took care of the interior designs. The new craft is currently being built under the supervision of Royal Lent, which as known, is Feadship's operative branch together with De Vries and De Voogt. The F45 tender's characteristic is to have a hull shaped like a catamaran's capable of ensuring stability when its immobile in the water, while cruising and ashore. It has been conceived to be hauled in or launched by a winch instead of a cumbersome davit. At its bows, a hydraulic platform simplifies passengers stepping, on it or off it, onto a beach, getting in and out of the water and more so if you're a scuba diver. 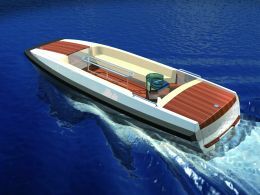 The tender's versatility is also proven by its equipment for water skiers helped by a single stern duo prop engine that enables it to reach a top speed of 33 knots fully laden. Ten passengers can sit comfortably on the lateral sofas which are separated by a stainless steel support rather like on boats for scuba diving while the pilot steers seated at the centre console which divides the cockpit from the engine cover. If need be, a special awning protects all of the seated area. The structure is in sandwich with woven stratified layers of vacuum sealed GRP which guarantee its lightweight, rigidity and ruggedness. To avoid possible damages when coming alongside, a large fender has been fitted from the bows to the stern along the sides. 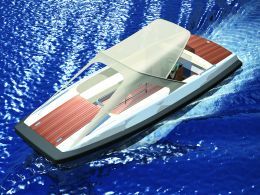 The launch date of the "couple," the F45 and the tender, is scheduled for the beginning of next summer.